Instant Pot prep makes this Chinese-style cumin lamb dish an even easier alternative to takeout. Lamb stew meat is simmered in Chinese spices until fork-tender. Spoon the meat and its flavorful juices over a bed of steamed white rice and serve with roasted broccoli and a cabbage salad tossed with sesame-tamari vinaigrette. This protein-packed power bowl features pasture-raised beef meatballs flavored with a blend of Greek spices, served over a bed of quinoa, romaine lettuce, and juicy heirloom tomatoes. Your bowl gets topped with thinly sliced radish and a creamy Greek yogurt-based tzatziki dressing. Flavors cook all together in this one-pan Whole30-friendly meal. 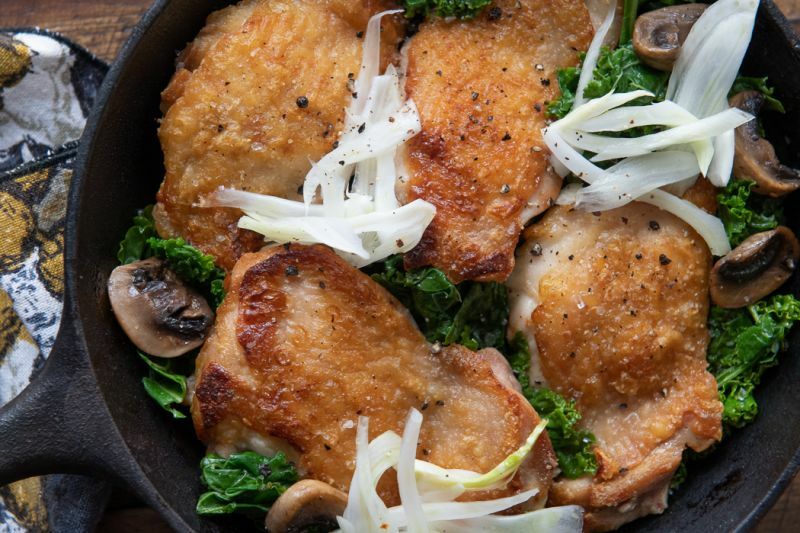 Pasture-raised chicken thighs sear in a skillet with kale, fennel, and mushrooms, all finished with an herb-dijon base that simmers with the chicken’s flavorful juices to create a complex and addictively delicious pan sauce. This cozy meal keeps it simple, spotlighting its best-of-the-best ingredients: Della Casa Pasta four cheese ravioli is tossed in cheesy squash butter sauce and served with a bed of sauteed kale. To give this meal an elegant finish, spinach with Meyer lemon vinaigrette rests on top of the ravioli to lightly wilt and balance with its delicate acidity. Buon appetito!